CRISPR/Cas9 has emerged as the genome editing method of choice. 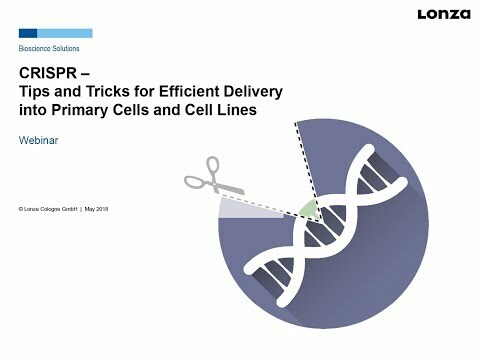 Explore the full CRISPR potential and hear about best practices to achieve optimal delivery results. Today, CRISPR/Cas9 has emerged as the genome editing method of choice in research, medicine, and biotechnology. Compared to other gene editing technologies (e.g. ZFNs and TALENs), it is simpler to re-engineer, easier to use, has broad versatility, and can target multiple sites. One essential factor enabling to explore the full CRISPR potential is efficient delivery of its components into physiologically relevant cell types. Many renowned scientists are already using Lonza’s non-viral NucleofectorTM Technology for delivering CRISPR plasmids or RNPs efficiently into various cell types. In this webinar, we discuss best practices to achieve optimal delivery results.